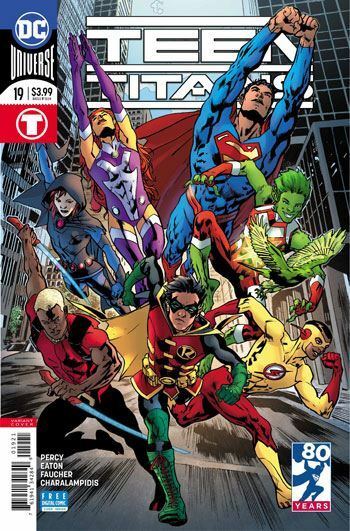 Like so many other books right now, Teen Titans comes to an end with this issue. Feels like DC is cancelling its entire line. 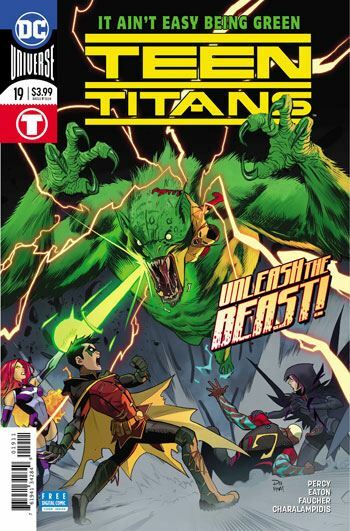 And, though I have said this already in other reviews, the latest issue of Teen Titans must be viewed not only on its own merits, but also as a conclusion to the run as a whole. Unlike many of the other series coming to their endings, this one actually works in both terms. The conclusion of the Neverland story makes great use of Beast Boy, and though the rest of the team is secondary, there is enough development and resolution to make it fulfilling as a finale. Partly that is due to the way the book began, with Damien kidnapping the rest of the team. Although this run lasted only 19 issues, we got to see him relaxing his death grip on the other members of the team, learning to trust and respect them, as much as he can. And, in turn, the other teammates have learned to trust and respect each other. On these terms, ending on the Beast Boy tale works very well. He is always the joker, the one who gets no respect, because he seems not to desire it. But of course that means he is the one most craving it. Overall, I would have liked some more development with the new Aqualad. Starfire didn’t quite get as much play as she might have, either. But then, with such a short run, one cannot have everything. A solid ending for an entertaining incarnation of the Teen Titans. And a good lead in to No Justice to close it all out.